Deep venous thrombosis (DVT) classically produces pain and limb edema; however, in a given patient, symptoms may be present or absent, unilateral or bilateral, or mild or severe. Thrombus that does not cause a net venous outflow obstruction is often asymptomatic. Edema is the most specific symptom of DVT. Thrombus that involves the iliac bifurcation, the pelvic veins, or the vena cava produces leg edema that is usually bilateral rather than unilateral. High partial obstruction often produces mild bilateral edema that is mistaken for the dependent edema of right-sided heart failure, fluid overload, or hepatic or renal insufficiency. Massive edema with cyanosis and ischemia (phlegmasia cerulea dolens) is rare. Leg pain occurs in 50% of patients, but this is entirely nonspecific. Pain can occur on dorsiflexion of the foot (Homans sign). Tenderness occurs in 75% of patients but is also found in 50% of patients without objectively confirmed DVT. When tenderness is present, it is usually confined to the calf muscles or along the course of the deep veins in the medial thigh. Pain and/or tenderness away from these areas is not consistent with venous thrombosis and usually indicates another diagnosis. The pain and tenderness associated with DVT does not usually correlate with the size, location, or extent of the thrombus. Warmth or erythema of skin can be present over the area of thrombosis. Clinical signs and symptoms of pulmonary embolism as the primary manifestation occur in 10% of patients with confirmed DVT. No single physical finding or combination of symptoms and signs is sufficiently accurate to establish the diagnosis of deep venous thrombosis (DVT). The classic finding of calf pain on dorsiflexion of the foot with the knee straight (Homans sign) has been a time-honored sign of DVT. However, Homans sign is neither sensitive nor specific: it is present in less than one third of patients with confirmed DVT, and is found in more than 50% of patients without DVT. Superficial thrombophlebitis is characterized by the finding of a palpable, indurated, cordlike, tender, subcutaneous venous segment. Forty percent of patients with superficial thrombophlebitis without coexisting varicose veins and with no other obvious etiology (eg, intravenous catheters, intravenous drug abuse, soft tissue injury) have an associated DVT. Patients with superficial thrombophlebitis extending to the saphenofemoral junction are also at higher risk for associated DVT. If a patient is thought to have pulmonary embolism (PE) or has documented PE, the absence of tenderness, erythema, edema, or a palpable cord upon examination of the lower extremities does not rule out thrombophlebitis, nor does it imply a source other than a leg vein. More than two thirds of patients with proven PE lack any clinically evident phlebitis. Nearly one third of patients with proven PE have no identifiable source of DVT, despite a thorough investigation. Autopsy studies suggest that even when the source is clinically inapparent, it lies undetected within the deep venous system of the lower extremity and pelvis in 90% of cases. Patients with venous thrombosis may have variable discoloration of the lower extremity. The most common abnormal hue is reddish purple from venous engorgement and obstruction. In rare cases, the leg is cyanotic from massive ileofemoral venous obstruction. This ischemic form of venous occlusion was originally described as phlegmasia cerulea dolens (“painful blue inflammation”). The leg is usually markedly edematous, painful, and cyanotic. Petechiae are often present. In relatively rare instances, acute extensive (lower leg–to-iliac) occlusion of venous outflow may create a blanched appearance of the leg because of edema. The clinical triad of pain, edema, and blanched appearance is termed phlegmasia alba dolens (“painful white inflammation”), a term originally used to describe massive ileofemoral venous thrombosis and associated arterial spasm. This is also known as milk-leg syndrome when it is associated with compression of the iliac vein by the gravid uterus. The affected extremity is often pale with poor or even absent distal pulses. The physical findings may suggest acute arterial occlusion, but the presence of swelling, petechiae, and distended superficial veins point to this condition. As many as half the patients with phlegmasia alba dolens have capillary involvement, which poses a risk of irreversible venous gangrene with massive fluid sequestration. In severely affectedpatients, immediate therapyisnecessarytoprevent limb loss. As many as 40% of patients have silent pulmonary embolism (PE) when symptomatic deep venous thrombosis (DVT) is diagnosed. Approximately 4% of individuals treated for DVT develop symptomatic PE. Almost 1% of postoperative hospitalized patients develop PE. The 10-12% mortality rate for PE in hospitalized patients underscores the need for prevention of this complication. Treatment options include anticoagulation therapy and placement of an inferior vena cava filter. If evidence of right heart failure is present or if adequate oxygenation cannot be maintained, the thrombus may be removed with pharmacomechanical thrombolytic intervention. Spiral computed tomography scan showing a pulmonary thrombus. PE is most often diagnosed by means of ventilation/perfusion lung scanning, which is reported as having a low, moderate, or high probability of depicting PE. When the results of these studies are equivocal, the use of spiral CT scans may be able to demonstrate intravascular thrombosis. In many institutions, the criterion standard for diagnosing PE is pulmonary angiography. Although rare, paradoxic emboli can occur in patients with cardiac defects (usually atrial septal defect), who are at risk for the passage of emboli to the arterial circulation and resultant stroke or embolization of a peripheral artery. Patients can present after cardiac failure occurs late in life, with resultant bedrest that increases the risk for deep venous thrombosis. Without treatment, one half of patients with deep venous thrombosis (DVT) have a recurrent, symptomatic venous thromboembolism (VTE) event within 3 months. After anticoagulation for an unprovoked VTE event is discontinued, the incidence is 5-15% per year. Presentations are similar, with pain and edema. However, the diagnosis may be difficult (ie, differentiating acute from chronic thrombus). Recurrence increases the risk of postthrombotic syndrome (PTS). A review by Martinelli et al indicates that hormonal therapy, including estrogen-containing agents, does not appear to be associated with recurrent VTE in women younger than 60 years receiving anticoagulation with rivaroxaban or enoxaparin/vitamin K antagonists for confirmed VTE. However, it was noted that abnormal uterine bleeding occurred more frequently with rivaroxaban than with enoxaparin/vitamin K antagonists. Haeger K. Problems of acute deep venous thrombosis. I. The interpretation of signs and symptoms. Angiology. 1969 Apr. 20(4):219-23. [Medline]. McLachlin J, Richards T, Paterson JC. An evaluation of clinical signs in the diagnosis of venous thrombosis. Arch Surg. 1962 Nov. 85:738-44. [Medline]. Meignan M, Rosso J, Gauthier H, et al. Systematic lung scans reveal a high frequency of silent pulmonary embolism in patients with proximal deep venous thrombosis. Arch Intern Med. 2000 Jan 24. 160(2):159-64. [Medline]. [Guideline] Snow V, Qaseem A, Barry P, et al. Management of venous thromboembolism: a clinical practice guideline from the American College of Physicians and the American Academy of Family Physicians. Ann Intern Med. 2007 Feb 6. 146(3):204-10. [Medline]. Buller HR, Ten Cate-Hoek AJ, Hoes AW, et al. Safely ruling out deep venous thrombosis in primary care. Ann Intern Med. 2009 Feb 17. 150(4):229-35. [Medline]. Bauersachs R, Berkowitz SD, Brenner B, et al. Oral rivaroxaban for symptomatic venous thromboembolism. N Engl J Med. 2010 Dec 23. 363(26):2499-510. [Medline]. [Full Text]. Buller HR, Prins MH, Lensin AW, et al. Oral rivaroxaban for the treatment of symptomatic pulmonary embolism. N Engl J Med. 2012 Apr 5. 366(14):1287-97. [Medline]. [Full Text]. Hughes S. Rivaroxaban stands up to standard anticoagulation for VTE treatment. Medscape Medical News. Medscape Heartwire from WebMD. December 13, 2012. Available at http://www.medscape.com/viewarticle/776147. Accessed: March 19, 2013. Jaff MR, McMurtry MS, Archer SL, et al. Management of massive and submassive pulmonary embolism, iliofemoral deep vein thrombosis, and chronic thromboembolic pulmonary hypertension: a scientific statement from the American Heart Association. Circulation. 2011 Apr 26. 123(16):1788-830. [Medline]. Chang R, Chen CC, Kam A, Mao E, Shawker TH, Horne MK 3rd. Deep vein thrombosis of lower extremity: direct intraclot injection of alteplase once daily with systemic anticoagulation--results of pilot study. Radiology. 2008 Feb. 246(2):619-29. [Medline]. Biuckians A, Meier GH 3rd. Treatment of symptomatic lower extremity acute deep venous thrombosis: role of mechanical thrombectomy. Vascular. 2007 Sep-Oct. 15(5):297-303. [Medline]. Li W, Salanitri J, Tutton S, et al. Lower extremity deep venous thrombosis: evaluation with ferumoxytol-enhanced MR imaging and dual-contrast mechanism--preliminary experience. Radiology. 2007 Mar. 242(3):873-81. [Medline]. Kakkos SK, Caprini JA, Geroulakos G, Nicolaides AN, Stansby GP, Reddy DJ. Combined intermittent pneumatic leg compression and pharmacological prophylaxis for prevention of venous thromboembolism in high-risk patients. Cochrane Database Syst Rev. 2008 Oct 8. CD005258. [Medline]. Araki CT, Back TL, Padberg FT, et al. The significance of calf muscle pump function in venous ulceration. J Vasc Surg. 1994 Dec. 20(6):872-7; discussion 878-9. [Medline]. Wakefield TW, Strieter RM, Schaub R, et al. Venous thrombosis prophylaxis by inflammatory inhibition without anticoagulation therapy. J Vasc Surg. 2000 Feb. 31(2):309-24. [Medline]. Wakefield TW, Proctor MC. Current status of pulmonary embolism and venous thrombosis prophylaxis. Semin Vasc Surg. 2000 Sep. 13(3):171-81. [Medline]. Gibbs NM. Venous thrombosis of the lower limbs with particular reference to bed-rest. Br J Surg. 1957 Nov. 45(191):209-36. [Medline]. Sevitt S. The structure and growth of valve-pocket thrombi in femoral veins. J Clin Pathol. 1974 Jul. 27(7):517-28. [Medline]. [Full Text]. Aronson DL, Thomas DP. Experimental studies on venous thrombosis: effect of coagulants, procoagulants and vessel contusion. Thromb Haemost. 1985 Dec 17. 54(4):866-70. [Medline]. Wessler S, Reimer SM, Sheps MC. Biologic assay of a thrombosis-inducing activity in human serum. J Appl Physiol. 1959 Nov. 14:943-6. [Medline]. Sevitt S. The mechanisms of canalisation in deep vein thrombosis. J Pathol. 1973 Jun. 110(2):153-65. [Medline]. Gandhi RH, Irizarry E, Nackman GB, Halpern VJ, Mulcare RJ, Tilson MD. Analysis of the connective tissue matrix and proteolytic activity of primary varicose veins. J Vasc Surg. 1993 Nov. 18(5):814-20. [Medline]. Rizzi A, Quaglio D, Vasquez G, et al. Effects of vasoactive agents in healthy and diseased human saphenous veins. J Vasc Surg. 1998 Nov. 28(5):855-61. [Medline]. Monreal M, Martorell A, Callejas JM, et al. Venographic assessment of deep vein thrombosis and risk of developing post-thrombotic syndrome: a prospective study. J Intern Med. 1993 Mar. 233(3):233-8. [Medline]. Strandness DE Jr, Langlois Y, Cramer M, Randlett A, Thiele BL. Long-term sequelae of acute venous thrombosis. JAMA. 1983 Sep 9. 250(10):1289-92. [Medline]. Prandoni P, Lensing AW, Cogo A, et al. The long-term clinical course of acute deep venous thrombosis. Ann Intern Med. 1996 Jul 1. 125(1):1-7. [Medline]. Meissner MH, Caps MT, Zierler BK, Bergelin RO, Manzo RA, Strandness DE Jr. Deep venous thrombosis and superficial venous reflux. J Vasc Surg. 2000 Jul. 32(1):48-56. [Medline]. Meissner MH, Caps MT, Zierler BK, et al. Determinants of chronic venous disease after acute deep venous thrombosis. J Vasc Surg. 1998 Nov. 28(5):826-33. [Medline]. Meissner MH, Manzo RA, Bergelin RO, Markel A, Strandness DE Jr. Deep venous insufficiency: the relationship between lysis and subsequent reflux. J Vasc Surg. 1993 Oct. 18(4):596-605; discussion 606-8. [Medline]. Caps MT, Manzo RA, Bergelin RO, Meissner MH, Strandness DE Jr. Venous valvular reflux in veins not involved at the time of acute deep vein thrombosis. J Vasc Surg. 1995 Nov. 22(5):524-31. [Medline]. Johnson BF, Manzo RA, Bergelin RO, Strandness DE Jr. Relationship between changes in the deep venous system and the development of the postthrombotic syndrome after an acute episode of lower limb deep vein thrombosis: a one- to six-year follow-up. J Vasc Surg. 1995 Feb. 21(2):307-12; discussion 313. [Medline]. Johnson BF, Manzo RA, Bergelin RO, Strandness DE Jr. The site of residual abnormalities in the leg veins in long-term follow-up after deep vein thrombosis and their relationship to the development of the post-thrombotic syndrome. Int Angiol. 1996 Mar. 15(1):14-9. [Medline]. Haenen JH, Wollersheim H, Janssen MC, et al. Evolution of deep venous thrombosis: a 2-year follow-up using duplex ultrasound scan and strain-gauge plethysmography. J Vasc Surg. 2001 Oct. 34(4):649-55. [Medline]. Andriopoulos A, Wirsing P, Botticher R. Results of iliofemoral venous thrombectomy after acute thrombosis: report on 165 cases. J Cardiovasc Surg (Torino). 1982 Mar-Apr. 23(2):123-4. [Medline]. Zheng Y, Zhou B, Pu X. [Frequency of protein C polymorphisms in Chinese population and thrombotic patients]. Zhonghua Yi Xue Za Zhi. 1998 Mar. 78(3):210-2. [Medline]. Juhan C, Alimi Y, Di Mauro P, Hartung O. Surgical venous thrombectomy. Cardiovasc Surg. 1999 Oct. 7(6):586-90. [Medline]. Saarinen J, Kallio T, Lehto M, Hiltunen S, Sisto T. The occurrence of the post-thrombotic changes after an acute deep venous thrombosis. A prospective two-year follow-up study. J Cardiovasc Surg (Torino). 2000 Jun. 41(3):441-6. [Medline]. Elliott G. Thrombolytic therapy for venous thromboembolism. Curr Opin Hematol. 1999 Sep. 6(5):304-8. [Medline]. Baker WF Jr. Diagnosis of deep venous thrombosis and pulmonary embolism. Med Clin North Am. 1998 May. 82(3):459-76. [Medline]. Henriksen O, Sejrsen P. Effect of "vein pump" activation upon venous pressure and blood flow in human subcutaneous tissue. Acta Physiol Scand. 1977 May. 100(1):14-21. [Medline]. Kearon C. Initial treatment of venous thromboembolism. Thromb Haemost. 1999 Aug. 82(2):887-91. [Medline]. Kakkar VV, Howes J, Sharma V, Kadziola Z. A comparative double-blind, randomised trial of a new second generation LMWH (bemiparin) and UFH in the prevention of post-operative venous thromboembolism. The Bemiparin Assessment group. Thromb Haemost. 2000 Apr. 83(4):523-9. [Medline]. Heit JA, Mohr DN, Silverstein MD, Petterson TM, O'Fallon WM, Melton LJ 3rd. Predictors of recurrence after deep vein thrombosis and pulmonary embolism: a population-based cohort study. Arch Intern Med. 2000 Mar 27. 160(6):761-8. [Medline]. Stein PD. Silent pulmonary embolism. Arch Intern Med. 2000 Jan 24. 160(2):145-6. [Medline]. Lewandowski A, Syska-Suminska J, Dluzniewski M. [Pulmonary embolism suspicion in a young female patient with the Paget-von Schrötter syndrome]. Kardiol Pol. 2008 Sep. 66(9):969-71. [Medline]. Acharya G, Singh K, Hansen JB, Kumar S, Maltau JM. Catheter-directed thrombolysis for the management of postpartum deep venous thrombosis. Acta Obstet Gynecol Scand. 2005 Feb. 84(2):155-8. [Medline]. Baarslag HJ, Koopman MM, Hutten BA, et al. Long-term follow-up of patients with suspected deep vein thrombosis of the upper extremity: survival, risk factors and post-thrombotic syndrome. Eur J Intern Med. 2004 Dec. 15(8):503-507. [Medline]. Joffe HV, Kucher N, Tapson VF, Goldhaber SZ. Upper-extremity deep vein thrombosis: a prospective registry of 592 patients. Circulation. 2004 Sep 21. 110(12):1605-11. [Medline]. Martinelli I, Battaglioli T, Bucciarelli P, Passamonti SM, Mannucci PM. Risk factors and recurrence rate of primary deep vein thrombosis of the upper extremities. Circulation. 2004 Aug 3. 110(5):566-70. [Medline]. Beyth RJ, Cohen AM, Landefeld CS. Long-term outcomes of deep-vein thrombosis. Arch Intern Med. 1995 May 22. 155(10):1031-7. [Medline]. Kistner RL, Ball JJ, Nordyke RA, Freeman GC. Incidence of pulmonary embolism in the course of thrombophlebitis of the lower extremities. Am J Surg. 1972 Aug. 124(2):169-76. [Medline]. Havig O. Deep vein thrombosis and pulmonary embolism. An autopsy study with multiple regression analysis of possible risk factors. Acta Chir Scand Suppl. 1977. 478:1-120. [Medline]. Higdon ML, Higdon JA. Treatment of oncologic emergencies. Am Fam Physician. 2006 Dec 1. 74 (11):1873-80. [Medline]. Guijarro Escribano JF, Anton RF, Colmenarejo Rubio A, et al. Superior vena cava syndrome with central venous catheter for chemotherapy treated successfully with fibrinolysis. Clin Transl Oncol. 2007 Mar. 9 (3):198-200. [Medline]. Baltayiannis N, Magoulas D, Anagnostopoulos D, et al. Percutaneous stent placement in malignant cases of superior vena cava syndrome. J BUON. 2005 Jul-Sep. 10 (3):377-80. [Medline]. Urruticoechea A, Mesia R, Dominguez J, et al. Treatment of malignant superior vena cava syndrome by endovascular stent insertion. Experience on 52 patients with lung cancer. 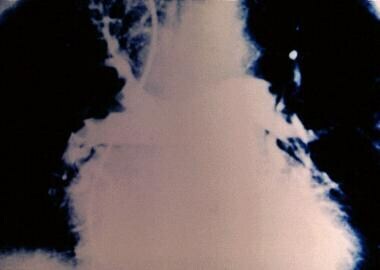 Lung Cancer. 2004 Feb. 43 (2):209-14. [Medline]. Arfvidsson B, Eklof B, Kistner RL, Masuda EM, Sato DT. Risk factors for venous thromboembolism following prolonged air travel. Coach class thrombosis. Hematol Oncol Clin North Am. 2000 Apr. 14(2):391-400, ix. [Medline]. Slipman CW, Lipetz JS, Jackson HB, Vresilovic EJ. Deep venous thrombosis and pulmonary embolism as a complication of bed rest for low back pain. Arch Phys Med Rehabil. 2000 Jan. 81(1):127-9. [Medline]. Ruggeri M, Tosetto A, Castaman G, Rodeghiero F. Congenital absence of the inferior vena cava: a rare risk factor for idiopathic deep-vein thrombosis. Lancet. 2001 Feb 10. 357(9254):441. [Medline]. Hamoud S, Nitecky S, Engel A, Goldsher D, Hayek T. Hypoplasia of the inferior vena cava with azygous continuation presenting as recurrent leg deep vein thrombosis. Am J Med Sci. 2000 Jun. 319(6):414-6. [Medline]. Greenfield LJ, Proctor MC. The percutaneous Greenfield filter: outcomes and practice patterns. J Vasc Surg. 2000 Nov. 32(5):888-93. [Medline]. Tsuji Y, Goto A, Hara I, et al. Renal cell carcinoma with extension of tumor thrombus into the vena cava: surgical strategy and prognosis. J Vasc Surg. 2001 Apr. 33(4):789-96. [Medline]. Stamatakis JD, Kakkar VV, Sagar S, Lawrence D, Nairn D, Bentley PG. Femoral vein thrombosis and total hip replacement. Br Med J. 1977 Jul 23. 2(6081):223-5. [Medline]. [Full Text]. Pullen LC. PICCs may double risk for clots in critically ill patients. Medscape Medical News from WebMD. May 20, 2013. Available at http://www.medscape.com/viewarticle/804428. Accessed: June 4, 2013. Chopra V, Anand S, Hickner A, et al. Risk of venous thromboembolism associated with peripherally inserted central catheters: a systematic review and meta-analysis. Lancet. 2013 Jul 27. 382(9889):311-25. [Medline]. Alikhan R, Cohen AT, Combe S, et al. Risk factors for venous thromboembolism in hospitalized patients with acute medical illness: analysis of the MEDENOX Study. Arch Intern Med. 2004 May 10. 164(9):963-8. [Medline]. Heit JA, Elliott CG, Trowbridge AA, Morrey BF, Gent M, Hirsh J. Ardeparin sodium for extended out-of-hospital prophylaxis against venous thromboembolism after total hip or knee replacement. A randomized, double-blind, placebo-controlled trial. Ann Intern Med. 2000 Jun 6. 132(11):853-61. [Medline]. Chu C, Tokumaru S, Izumi K, Nakagawa K. Obesity increases risk of anticoagulation reversal failure with prothrombin complex concentrate in those with intracranial hemorrhage. Int J Neurosci. 2016 Jan. 126 (1):62-6. [Medline]. Nordstrom M, Lindblad B, Bergqvist D, Kjellstrom T. A prospective study of the incidence of deep-vein thrombosis within a defined urban population. J Intern Med. 1992 Aug. 232(2):155-60. [Medline]. Dahlback B. Inherited thrombophilia: resistance to activated protein C as a pathogenic factor of venous thromboembolism. Blood. 1995 Feb 1. 85(3):607-14. [Medline]. Anderson FA Jr, Wheeler HB, Goldberg RJ, Hosmer DW, Forcier A. The prevalence of risk factors for venous thromboembolism among hospital patients. Arch Intern Med. 1992 Aug. 152(8):1660-4. [Medline]. Warlow C, Ogston D, Douglas AS. Deep venous thrombosis of the legs after strokes. Part I--incidence and predisposing factors. Br Med J. 1976 May 15. 1(6019):1178-81. [Medline]. [Full Text]. Monreal M, Lafoz E, Casals A, et al. Occult cancer in patients with deep venous thrombosis. A systematic approach. Cancer. 1991 Jan 15. 67(2):541-5. [Medline]. Rickles FR, Levine M, Edwards RL. Hemostatic alterations in cancer patients. Cancer Metastasis Rev. 1992 Nov. 11(3-4):237-48. [Medline]. Levine MN, Gent M, Hirsh J, et al. The thrombogenic effect of anticancer drug therapy in women with stage II breast cancer. N Engl J Med. 1988 Feb 18. 318(7):404-7. [Medline]. Clagett GP, Reisch JS. Prevention of venous thromboembolism in general surgical patients. Results of meta-analysis. Ann Surg. 1988 Aug. 208(2):227-40. [Medline]. [Full Text]. Clagett GP, Anderson FA Jr, Heit J, Levine MN, Wheeler HB. Prevention of venous thromboembolism. Chest. 1995 Oct. 108(4 Suppl):312S-334S. [Medline]. Coagulation and thromboembolism in orthopaedic surgery. Beaty JH, ed. Orthopaedic Knowledge Update. Rosemont, IL: Amer Academy of Orthopaedic Surgeons; 1999. 6: 63-72. Kakkar VV, Howe CT, Nicolaides AN, Renney JT, Clarke MB. Deep vein thrombosis of the leg. Is there a "high risk" group?. Am J Surg. 1970 Oct. 120(4):527-30. [Medline]. Motykie GD, Caprini JA, Arcelus JI, et al. Risk factor assessment in the management of patients with suspected deep venous thrombosis. Int Angiol. 2000 Mar. 19(1):47-51. [Medline]. Motykie GD, Zebala LP, Caprini JA, et al. A guide to venous thromboembolism risk factor assessment. J Thromb Thrombolysis. 2000 Apr. 9(3):253-62. [Medline]. Schafer AI. Hypercoagulable states: molecular genetics to clinical practice. Lancet. 1994 Dec 24-31. 344(8939-8940):1739-42. [Medline]. Meissner MH, Strandness E. Pathophysiology and natural history of acute deep venous thrombosis, Rutherford’s Vascular Surgery. 2005. 2124-2142. Ho CH, Chau WK, Hsu HC, Gau JP, Yu TJ. Causes of venous thrombosis in fifty Chinese patients. Am J Hematol. 2000 Feb. 63(2):74-8. [Medline]. Vandenbrouke JP, Bloemenkamp KW, Rosendaal FR, Helmerhorst FM. Incidence of venous thromboembolism in users of combined oral contraceptives. Risk is particularly high with first use of oral contraceptives. BMJ. 2000 Jan 1. 320(7226):57-8. [Medline]. Cushman M, Tsai AW, White RH, et al. Deep vein thrombosis and pulmonary embolism in two cohorts: the longitudinal investigation of thromboembolism etiology. Am J Med. 2004 Jul 1. 117(1):19-25. [Medline]. Bollen L, Vande Casteele N, Ballet V, et al. Thromboembolism as an important complication of inflammatory bowel disease. Eur J Gastroenterol Hepatol. 2016 Jan. 28 (1):1-7. [Medline]. Sevitt S, Gallagher N. Venous thrombosis and pulmonary embolism. A clinico-pathological study in injured and burned patients. Br J Surg. 1961 Mar. 48:475-89. [Medline]. Gorman WP, Davis KR, Donnelly R. ABC of arterial and venous disease. Swollen lower limb-1: general assessment and deep vein thrombosis. BMJ. 2000 May 27. 320(7247):1453-6. [Medline]. [Full Text]. Martinelli I, Lensing AW, Middeldorp S, et al. Recurrent venous thromboembolism and abnormal uterine bleeding with anticoagulant and hormone therapy use. Blood. 2015 Dec 22. [Medline]. Kearon C, Crowther M, Hirsh J. Management of patients with hereditary hypercoagulable disorders. Annu Rev Med. 2000. 51:169-85. [Medline]. Prandoni P, Mannucci PM. Deep-vein thrombosis of the lower limbs: diagnosis and management. Baillieres Best Pract Res Clin Haematol. 1999 Sep. 12(3):533-54. [Medline]. Rathbun SW, Raskob GE, Whitsett TL. Sensitivity and specificity of helical computed tomography in the diagnosis of pulmonary embolism: a systematic review. Ann Intern Med. 2000 Feb 1. 132(3):227-32. [Medline]. Goldhaber SZ. Diagnosis of deep venous thrombosis. Clin Cornerstone. 2000. 2(4):29-37. [Medline]. Signorelli SS, Valerio F, Davide C, et al. Evaluating the potential of routine blood tests to identify the risk of deep vein thrombosis: a 1-year monocenter cohort study. Angiology. 2017 Aug. 68 (7):592-7. [Medline]. Lensing AW. Anticoagulation in acute ischaemic stroke: deep vein thrombosis prevention and long-term stroke outcomes. Blood Coagul Fibrinolysis. 1999 Aug. 10 Suppl 2:S123-7. [Medline]. Lensing AW, Prins MH. Recurrent deep vein thrombosis and two coagulation factor gene mutations: quo vadis?. Thromb Haemost. 1999 Dec. 82(6):1564-6. [Medline]. Kleinjan A, Di Nisio M, Beyer-Westendorf J, et al. Safety and feasibility of a diagnostic algorithm combining clinical probability, d-dimer testing, and ultrasonography for suspected upper extremity deep venous thrombosis: a prospective management study. Ann Intern Med. 2014 Apr 1. 160(7):451-7. [Medline]. Deitelzweig S, Jaff MR. Medical management of venous thromboembolic disease. Tech Vasc Interv Radiol. 2004 Jun. 7(2):63-7. [Medline]. McGarry LJ, Stokes ME, Thompson D. Outcomes of thromboprophylaxis with enoxaparin vs. unfractionated heparin in medical inpatients. Thromb J. 2006 Sep 27. 4:17. [Medline]. Cosmi B, Palareti G. D-dimer, oral anticoagulation, and venous thromboembolism recurrence. Semin Vasc Med. 2005 Nov. 5(4):365-70. [Medline]. Linkins LA, Bates SM, Lang E, et al. Selective D-dimer testing for diagnosis of a first suspected episode of deep venous thrombosis: a randomized trial. Ann Intern Med. 2013 Jan 15. 158(2):93-100. [Medline]. Brown T. Selective D-dimer testing best for DVT diagnosis. Medscape Heartwire from WebMD. January 15, 2013. Available at http://www.medscape.com/viewarticle/791417. Accessed: March 19, 2013. Perrier A, Desmarais S, Miron MJ, et al. Non-invasive diagnosis of venous thromboembolism in outpatients. Lancet. 1999 Jan 16. 353(9148):190-5. [Medline]. Wells PS, Anderson DR, Rodger M, et al. Evaluation of D-dimer in the diagnosis of suspected deep-vein thrombosis. N Engl J Med. 2003 Sep 25. 349(13):1227-35. [Medline]. Nakamura M, Yamada N, Oda E, et al. Predictors of venous thromboembolism recurrence and the bleeding events identified using a Japanese healthcare database. J Cardiol. 2017 Aug. 70 (2):155-62. [Medline]. Ita K. Transdermal delivery of heparin: Physical enhancement techniques. Int J Pharm. 2015 Dec 30. 496 (2):240-9. [Medline]. [Guideline] Kearon C, Akl EA, Ornelas J, et al. Antithrombotic therapy for VTE disease: CHEST guideline and expert panel report. Chest. 2016 Feb. 149 (2):315-52. [Medline]. [Full Text]. Tromeur C, Van Der Pol LM, Couturaud F, Klok FA, Huisman MV. Therapeutic management of acute pulmonary embolism. Expert Rev Respir Med. 2017 Aug. 11 (8):641-8. [Medline]. van der Hulle T, Dronkers CE, Klok FA, Huisman MV. Recent developments in the diagnosis and treatment of pulmonary embolism. J Intern Med. 2016 Jan. 279 (1):16-29. [Medline]. Park J, Byun Y. Recent advances in anticoagulant drug delivery. Expert Opin Drug Deliv. 2015 Dec 23. 1-14. [Medline]. Kabuki T, Nakanishi R, Hisatake S, et al. A treatment strategy using subcutaneous fondaparinux followed by oral rivaroxaban is effective for treating acute venous thromboembolism. J Cardiol. 2017 Aug. 70 (2):163-8. [Medline]. Bijsterveld NR, Moons AH, Boekholdt SM, et al. Ability of recombinant factor VIIa to reverse the anticoagulant effect of the pentasaccharide fondaparinux in healthy volunteers. Circulation. 2002 Nov 12. 106(20):2550-4. [Medline]. Lassen MR, Gallus A, Raskob GE, Pineo G, Chen D, Ramirez LM. Apixaban versus enoxaparin for thromboprophylaxis after hip replacement. N Engl J Med. 2010 Dec 23. 363(26):2487-98. [Medline]. [Full Text]. Lassen MR, Raskob GE, Gallus A, Pineo G, Chen D, Hornick P. Apixaban versus enoxaparin for thromboprophylaxis after knee replacement (ADVANCE-2): a randomised double-blind trial. Lancet. 2010 Mar 6. 375(9717):807-15. [Medline]. US Food and Drug Administration. Supplement approval (apixaban) [letter]. August 19, 2014. Available at http://www.accessdata.fda.gov/drugsatfda_docs/appletter/2014/202155Orig1s006ltr.pdf. Accessed: August 28, 2014. Agnelli G, Buller HR, Cohen A, et al, for the AMPLIFY Investigators. Oral apixaban for the treatment of acute venous thromboembolism. N Engl J Med. 2013 Aug 29. 369 (9):799-808. [Medline]. [Full Text]. Agnelli G, Buller HR, Cohen A, et al, for the AMPLIFY-EXT Investigators. Apixaban for extended treatment of venous thromboembolism. N Engl J Med. 2013 Feb 21. 368 (8):699-708. [Medline]. [Full Text]. Liu X, Thompson J, Phatak H, et al. Extended anticoagulation with apixaban reduces hospitalisations in patients with venous thromboembolism. An analysis of the AMPLIFY-EXT trial. Thromb Haemost. 2015 Dec 22. 115 (1):161-8. [Medline]. Schulman S, Kearon C, Kakkar AK, et al, for the RE-COVER Study Group. Dabigatran versus warfarin in the treatment of acute venous thromboembolism. N Engl J Med. 2009 Dec 10. 361 (24):2342-52. [Medline]. Schulman S, Kakkar AK, Goldhaber SZ, et al, for the RE-COVER II Trial Investigators. Treatment of acute venous thromboembolism with dabigatran or warfarin and pooled analysis. Circulation. 2014 Feb 18. 129 (7):764-72. [Medline]. Schulman S, Kearon C, Kakkar AK, et al, for the RE-MEDY Trial Investigators, RE-SONATE Trial Investigators. Extended use of dabigatran, warfarin, or placebo in venous thromboembolism. N Engl J Med. 2013 Feb 21. 368 (8):709-18. [Medline]. US Food and Drug Administration. FDA approves anti-clotting drug Savaysa [news release]. Available at https://www.fda.gov/newsevents/newsroom/pressannouncements/ucm429523.htm. January 8, 2015; Accessed: July 16, 2015. Buller HR, Decousus H, Grosso MA, for the Hokusai-VTE Investigators. Edoxaban versus warfarin for the treatment of symptomatic venous thromboembolism. N Engl J Med. 2013 Oct 10. 369 (15):1406-15. [Medline]. Cohen AT, Harrington RA, Goldhaber SZ, et al, for the APEX Investigators. Extended thromboprophylaxis with betrixaban in acutely Ill medical patients. N Engl J Med. 2016 Aug 11. 375 (6):534-44. [Medline]. [Full Text]. Gibson CM, Chi G, Halaby R, et al, for the, APEX Investigators. Extended-duration betrixaban reduces the risk of stroke versus standard-dose enoxaparin among hospitalized medically Ill patients: an APEX trial substudy (acute medically Ill venous thromboembolism prevention with extended duration betrixaban). Circulation. 2017 Feb 14. 135 (7):648-55. [Medline]. Prandoni P, Prins MH, Lensing AW, et al. Residual thrombosis on ultrasonography to guide the duration of anticoagulation in patients with deep venous thrombosis: a randomized trial. Ann Intern Med. 2009 May 5. 150(9):577-85. [Medline]. Schulman S, Granqvist S, Holmstrom M, et al. The duration of oral anticoagulant therapy after a second episode of venous thromboembolism. The Duration of Anticoagulation Trial Study Group. N Engl J Med. 1997 Feb 6. 336 (6):393-8. [Medline]. Lee AY, Levine MN, Baker RI, et al. Low-molecular-weight heparin versus a coumarin for the prevention of recurrent venous thromboembolism in patients with cancer. N Engl J Med. 2003 Jul 10. 349(2):146-53. [Medline]. Hull R, Pineo G, Mah A, et al. A randomized trial evaluating long term low molecular weight heparin therapy for three months verses intravenous heparin followed by warfarin sodium. Blood 100. 2002. 148a. Pettila V, Kaaja R, Leinonen P, Ekblad U, Kataja M, Ikkala E. Thromboprophylaxis with low molecular weight heparin (dalteparin) in pregnancy. Thromb Res. 1999 Nov 15. 96(4):275-82. [Medline]. Zidane M, Schram MT, Planken EW, et al. Frequency of major hemorrhage in patients treated with unfractionated intravenous heparin for deep venous thrombosis or pulmonary embolism: a study in routine clinical practice. Arch Intern Med. 2000 Aug 14-28. 160(15):2369-73. [Medline]. Vo T, Vazquez S, Rondina MT. Current state of anticoagulants to treat deep venous thrombosis. Curr Cardiol Rep. 2014 Mar. 16(3):463. [Medline]. Levi M, Eerenberg E, Kamphuisen PW. Bleeding risk and reversal strategies for old and new anticoagulants and antiplatelet agents. J Thromb Haemost. 2011 Sep. 9 (9):1705-12. [Medline]. Hirsh J, Bauer KA, Donati MB, Gould M, Samama MM, Weitz JI. Parenteral anticoagulants: American College of Chest Physicians Evidence-Based Clinical Practice Guidelines (8th Edition). Chest. 2008 Jun. 133 (6 suppl):141S-159S. [Medline]. Marshall A, Levine M, Howell ML, et al. Dose-associated pulmonary complication rates after fresh frozen plasma administration for warfarin reversal. J Thromb Haemost. 2015 Dec 8. [Medline]. Purrucker JC, Haas K, Rizos T, et al. Early clinical and radiological course, management, and outcome of intracerebral hemorrhage related to new oral anticoagulants. JAMA Neurol. 2015 Dec 14. 1-10. [Medline]. Aronis KN, Hylek EM. Who, when, and how to reverse non-vitamin K oral anticoagulants. J Thromb Thrombolysis. 2015 Dec 1. 123 (6):1350-61. [Medline]. US Food and Drug Administration. FDA approves Praxbind, the first reversal agent for the anticoagulant Pradaxa [news release]. Available at http://www.fda.gov/NewsEvents/Newsroom/PressAnnouncements/ucm467300.htm. October 16, 2015; Accessed: March 30, 2016. Pollack CV Jr, Reilly PA, Eikelboom J, et al. Idarucizumab for dabigatran reversal. N Engl J Med. 2015 Aug 6. 373 (6):511-20. [Medline]. Eikelboom JW, Quinlan DJ, van Ryn J, Weitz JI. Idarucizumab: the antidote for reversal of dabigatran. Circulation. 2015 Dec 22. 132 (25):2412-22. [Medline]. Ansell JE. Universal, class-specific and drug-specific reversal agents for the new oral anticoagulants. J Thromb Thrombolysis. 2016 Feb. 41 (2):248-52. [Medline]. Ghadimi K, Dombrowski KE, Levy JH, Welsby IJ. Andexanet alfa for the reversal of factor Xa inhibitor related anticoagulation. Expert Rev Hematol. 2015 Dec 21. [Medline]. Ansell JE, Bakhru SH, Laulicht BE, et al. Use of PER977 to reverse the anticoagulant effect of edoxaban. N Engl J Med. 2014 Nov 27. 371 (22):2141-2. [Medline]. Enden T, Haig Y, Klow NE, et al for CaVenT Study Group. Long-term outcome after additional catheter-directed thrombolysis versus standard treatment for acute iliofemoral deep vein thrombosis (the CaVenT study): a randomised controlled trial. Lancet. 2012 Jan 7. 379(9810):31-8. [Medline]. [Guideline] Kearon C, Akl EA, Comerota AJ, et al. Antithrombotic therapy for VTE disease: antithrombotic therapy and prevention of thrombosis, 9th ed: American College of Chest Physicians evidence-based clinical practice guidelines. Chest. 2012 Feb. 141 (2 suppl):e419S-e496S. [Medline]. Plate G, Akesson H, Einarsson E, Ohlin P, Eklof B. Long-term results of venous thrombectomy combined with a temporary arterio-venous fistula. Eur J Vasc Surg. 1990 Oct. 4(5):483-9. [Medline]. Eklof B, Kistner RL. Is there a role for thrombectomy in iliofemoral venous thrombosis?. Semin Vasc Surg. 1996 Mar. 9(1):34-45. [Medline]. Mewissen MW, Seabrook GR, Meissner MH, Cynamon J, Labropoulos N, Haughton SH. Catheter-directed thrombolysis for lower extremity deep venous thrombosis: report of a national multicenter registry. Radiology. 1999 Apr. 211(1):39-49. [Medline]. Prandoni P, Lensing AW, Prins MH, et al. Below-knee elastic compression stockings to prevent the post-thrombotic syndrome: a randomized, controlled trial. Ann Intern Med. 2004 Aug 17. 141(4):249-56. [Medline]. [Guideline] Hirsh J, Guyatt G, Albers GW, Harrington R, Schunemann HJ. Antithrombotic and thrombolytic therapy: American College of Chest Physicians evidence-based clinical practice guidelines (8th edition). Chest. 2008 Jun. 133 (6 suppl):110S-112S. [Medline]. Partsch H. Ambulation and compression after deep vein thrombosis: dispelling myths. Semin Vasc Surg. 2005 Sep. 18(3):148-52. [Medline]. Kahn SR, Shrier I, Kearon C. Physical activity in patients with deep venous thrombosis: a systematic review. Thromb Res. 2008. 122(6):763-73. [Medline]. Ramos R, Salem BI, De Pawlikowski MP, Coordes C, Eisenberg S, Leidenfrost R. The efficacy of pneumatic compression stockings in the prevention of pulmonary embolism after cardiac surgery. Chest. 1996 Jan. 109(1):82-5. [Medline]. Skillman JJ, Collins RE, Coe NP, et al. Prevention of deep vein thrombosis in neurosurgical patients: a controlled, randomized trial of external pneumatic compression boots. Surgery. 1978 Mar. 83(3):354-8. [Medline]. Kolluri R, Plessa AL, Sanders MC, Singh NK, Lucore C. A randomized study of the safety and efficacy of fondaparinux versus placebo in the prevention of venous thromboembolism after coronary artery bypass graft surgery. Am Heart J. 2016 Jan. 171 (1):1-6. [Medline]. Agnelli G, Prandoni P, Santamaria MG, et al. Three months versus one year of oral anticoagulant therapy for idiopathic deep venous thrombosis. Warfarin Optimal Duration Italian Trial Investigators. N Engl J Med. 2001 Jul 19. 345(3):165-9. [Medline]. Alkjaersig N, Fletcher AP, Sherry S. The mechanism of clot dissolution by plasmin. J Clin Invest. 1959 Jul. 38(7):1086-95. [Medline]. [Full Text]. [Guideline] Qaseem A, Snow V, Barry P, et al for the Joint American Academy of Family Physicians/American College of Physicians Panel on Deep Venous Thrombosis/Pulmonary Embolism. Current diagnosis of venous thromboembolism in primary care: a clinical practice guideline from the American Academy of Family Physicians and the American College of Physicians. Ann Fam Med. 2007 Jan-Feb. 5(1):57-62. [Medline]. [Full Text]. Bauer KA, Eriksson BI, Lassen MR, Turpie AG. Fondaparinux compared with enoxaparin for the prevention of venous thromboembolism after elective major knee surgery. N Engl J Med. 2001 Nov 1. 345(18):1305-10. [Medline]. Berend KR, Lombardi AV Jr. Multimodal venous thromboembolic disease prevention for patients undergoing primary or revision total joint arthroplasty: the role of aspirin. Am J Orthop (Belle Mead NJ). 2006 Jan. 35(1):24-9. [Medline]. Bergmann JF, Neuhart E. A multicenter randomized double-blind study of enoxaparin compared with unfractionated heparin in the prevention of venous thromboembolic disease in elderly in-patients bedridden for an acute medical illness. The Enoxaparin in Medicine Study Group. Thromb Haemost. 1996 Oct. 76(4):529-34. [Medline]. Bjarnason H, Kruse JR, Asinger DA, et al. Iliofemoral deep venous thrombosis: safety and efficacy outcome during 5 years of catheter-directed thrombolytic therapy. J Vasc Interv Radiol. 1997 May-Jun. 8(3):405-18. [Medline]. Boudes PF. The challenges of new drugs benefits and risks analysis: lessons from the ximelagatran FDA Cardiovascular Advisory Committee. Contemp Clin Trials. 2006 Oct. 27(5):432-40. [Medline]. Breddin HK. Low molecular weight heparins in the prevention of deep-vein thrombosis in general surgery. Semin Thromb Hemost. 1999. 25 Suppl 3:83-9. [Medline]. Bristol-Myers Squibb. US FDA approves Eliquis (apixaban) to reduce the risk of blood clots following hip or knee replacement surgery [press release]. Available at http://news.bms.com/press-release/us-fda-approves-eliquis-apixaban-reduce-risk-blood-clots-following-hip-or-knee-replace. Accessed: March 25, 2014. Bulger CM, Jacobs C, Patel NH. Epidemiology of acute deep vein thrombosis. Tech Vasc Interv Radiol. 2004 Jun. 7(2):50-4. [Medline]. Burke DT. Prevention of deep venous thrombosis: overview of available therapy options for rehabilitation patients. Am J Phys Med Rehabil. 2000 Sep-Oct. 79(5 Suppl):S3-8. [Medline]. Camporese G, Bernardi E, Prandoni P, et al. Low-molecular-weight heparin versus compression stockings for thromboprophylaxis after knee arthroscopy: a randomized trial. Ann Intern Med. 2008 Jul 15. 149(2):73-82. [Medline]. Caprini JA, Arcelus JI, Maksimovic D, Glase CJ, Sarayba JG, Hathaway K. Thrombosis prophylaxis in orthopedic surgery: current clinical considerations. J South Orthop Assoc. 2002 Winter. 11(4):190-6. [Medline]. Cham MD, Yankelevitz DF, Shaham D, et al. Deep venous thrombosis: detection by using indirect CT venography. The Pulmonary Angiography-Indirect CT Venography Cooperative Group. Radiology. 2000 Sep. 216(3):744-51. [Medline]. Chan WS, Spencer FA, Lee AY, et al. Safety of withholding anticoagulation in pregnant women with suspected deep vein thrombosis following negative serial compression ultrasound and iliac vein imaging. CMAJ. 2013 Mar 5. 185(4):E194-200. [Medline]. [Full Text]. Cho JS, Martelli E, Mozes G, Miller VM, Gloviczki P. Effects of thrombolysis and venous thrombectomy on valvular competence, thrombogenicity, venous wall morphology, and function. J Vasc Surg. 1998 Nov. 28(5):787-99. [Medline]. Coche EE, Hamoir XL, Hammer FD, Hainaut P, Goffette PP. Using dual-detector helical CT angiography to detect deep venous thrombosis in patients with suspicion of pulmonary embolism: diagnostic value and additional findings. AJR Am J Roentgenol. 2001 Apr. 176(4):1035-9. [Medline]. Colwell C, Mouret P. Ximelagatran for the prevention of venous thromboembolism following elective hip or knee replacement surgery. Semin Vasc Med. 2005 Aug. 5(3):266-75. [Medline]. Comerota AJ, Throm RC, Mathias SD, Haughton S, Mewissen M. Catheter-directed thrombolysis for iliofemoral deep venous thrombosis improves health-related quality of life. J Vasc Surg. 2000 Jul. 32(1):130-7. [Medline]. Comp PC, Spiro TE, Friedman RJ, et al. Prolonged enoxaparin therapy to prevent venous thromboembolism after primary hip or knee replacement. Enoxaparin Clinical Trial Group. J Bone Joint Surg Am. 2001 Mar. 83-A(3):336-45. [Medline]. Dranitsaris G, Stumpo C, Smith R, Bartle W. Extended dalteparin prophylaxis for venous thromboembolic events: cost-utility analysis in patients undergoing major orthopedic surgery. Am J Cardiovasc Drugs. 2009. 9(1):45-58. [Medline]. Dennis M, Sandercock P, Reid J, Graham C, Forbes J, Murray G. Effectiveness of intermittent pneumatic compression in reduction of risk of deep vein thrombosis in patients who have had a stroke (CLOTS 3): a multicentre randomised controlled trial. CLOTS (Clots in Legs Or sTockings after Stroke) Trials Collaboration. Lancet. 2013 Aug 10. 382(9891):516-24. [Medline]. Eklof B, Arfvidsson B, Kistner RL, Masuda EM. Indications for surgical treatment of iliofemoral vein thrombosis. Hematol Oncol Clin North Am. 2000 Apr. 14(2):471-82. [Medline]. Epstein NE. Efficacy of pneumatic compression stocking prophylaxis in the prevention of deep venous thrombosis and pulmonary embolism following 139 lumbar laminectomies with instrumented fusions. J Spinal Disord Tech. 2006 Feb. 19(1):28-31. [Medline]. Eriksson BI, Borris LC, Friedman RJ, et al. Rivaroxaban versus enoxaparin for thromboprophylaxis after hip arthroplasty. N Engl J Med. 2008 Jun 26. 358(26):2765-75. [Medline]. Eskeland G, Solheim K, Skjorten F. Anticoagulant prophylaxis, thromboembolism and mortality in elderly patients with hip fractures. A controlled clinical trial. Acta Chir Scand. 1966 Jan-Feb. 131(1):16-29. [Medline]. Fisher CG, Blachut PA, Salvian AJ, Meek RN, O'Brien PJ. Effectiveness of pneumatic leg compression devices for the prevention of thromboembolic disease in orthopaedic trauma patients: a prospective, randomized study of compression alone versus no prophylaxis. J Orthop Trauma. 1995 Feb. 9(1):1-7. [Medline]. Francis CW, Berkowitz SD, Comp PC, et al. Comparison of ximelagatran with warfarin for the prevention of venous thromboembolism after total knee replacement. N Engl J Med. 2003 Oct 30. 349(18):1703-12. [Medline]. Gaffney PJ, Creighton LJ, Callus M, Thorpe R. Monoclonal antibodies to crosslinked fibrin degradation products (XL-FDP). II. Evaluation in a variety of clinical conditions. Br J Haematol. 1988 Jan. 68(1):91-6. [Medline]. Geerts WH, Heit JA, Clagett GP, et al. Prevention of venous thromboembolism. Chest. 2001 Jan. 119(1 Suppl):132S-175S. [Medline]. Gerotziafas GT, Samama MM. Heterogeneity of synthetic factor Xa inhibitors. Curr Pharm Des. 2005. 11(30):3855-76. [Medline]. Gillies TE, Ruckley CV, Nixon SJ. Still missing the boat with fatal pulmonary embolism. Br J Surg. 1996 Oct. 83(10):1394-5. [Medline]. Ginsberg JS, Turkstra F, Buller HR, MacKinnon B, Magier D, Hirsh J. Postthrombotic syndrome after hip or knee arthroplasty: a cross-sectional study. Arch Intern Med. 2000 Mar 13. 160(5):669-72. [Medline]. Grossman C, McPherson S. Safety and efficacy of catheter-directed thrombolysis for iliofemoral venous thrombosis. AJR Am J Roentgenol. 1999 Mar. 172(3):667-72. [Medline]. Heit JA, Silverstein MD, Mohr DN, Petterson TM, O'Fallon WM, Melton LJ 3rd. Risk factors for deep vein thrombosis and pulmonary embolism: a population-based case-control study. Arch Intern Med. 2000 Mar 27. 160(6):809-15. [Medline]. Henderson D. DVT in pregnancy ruled out by serial Doppler ultrasound. Medscape Medical News from WebMD. January 14, 2013. Available at http://www.medscape.com/viewarticle/777659. Accessed: March 25, 2014. Horellou MH, Conrad J, Samama MM. Hull RD, Raskob GE, Pineo GF, eds. Venous Thromboembolism: An Evidence-Based Atlas. Armonk, NY: Futura; 1996. Hull RD, Pineo GF. Prophylaxis of deep venous thrombosis and pulmonary embolism. Current recommendations. Med Clin North Am. 1998 May. 82(3):477-93. [Medline]. Hull RD, Pineo GF, Francis C, et al. Low-molecular-weight heparin prophylaxis using dalteparin extended out-of-hospital vs in-hospital warfarin/out-of-hospital placebo in hip arthroplasty patients: a double-blind, randomized comparison. North American Fragmin Trial Investigators. Arch Intern Med. 2000 Jul 24. 160(14):2208-15. [Medline]. Hull RD, Pineo GF, Stein PD, et al. Timing of initial administration of low-molecular-weight heparin prophylaxis against deep vein thrombosis in patients following elective hip arthroplasty: a systematic review. Arch Intern Med. 2001 Sep 10. 161(16):1952-60. [Medline]. Iskander GA, Nelson RS, Morehouse DL, Tenquist JE, Szlabick RE. Incidence and propagation of infrageniculate deep venous thrombosis in trauma patients. J Trauma. 2006 Sep. 61(3):695-700. [Medline]. Kakkar AK, Brenner B, Dahl OE, et al. Extended duration rivaroxaban versus short-term enoxaparin for the prevention of venous thromboembolism after total hip arthroplasty: a double-blind, randomised controlled trial. Lancet. 2008 Jul 5. 372(9632):31-9. [Medline]. Kakkar VV, Adams PC. Preventive and therapeutic approach to venous thromboembolic disease and pulmonary embolism--can death from pulmonary embolism be prevented?. J Am Coll Cardiol. 1986 Dec. 8(6 Suppl B):146B-158B. [Medline]. Katz DS, Hon M. Current DVT imaging. Tech Vasc Interv Radiol. 2004 Jun. 7(2):55-62. [Medline]. Kearon C. Epidemiology of venous thromboembolism. Semin Vasc Med. 2001. 1(1):7-26. [Medline]. Kearon C, Ginsberg JS, Julian JA, et al. Comparison of fixed-dose weight-adjusted unfractionated heparin and low-molecular-weight heparin for acute treatment of venous thromboembolism. JAMA. 2006 Aug 23. 296(8):935-42. [Medline]. Kearon C, Ginsberg JS, Kovacs MJ, et al. Comparison of low-intensity warfarin therapy with conventional-intensity warfarin therapy for long-term prevention of recurrent venous thromboembolism. N Engl J Med. 2003 Aug 14. 349(7):631-9. [Medline]. Kearon C, Julian JA, Newman TE, Ginsberg JS. Noninvasive diagnosis of deep venous thrombosis. McMaster Diagnostic Imaging Practice Guidelines Initiative. Ann Intern Med. 1998 Apr 15. 128(8):663-77. [Medline]. Keeney JA, Clohisy JC, Curry MC, Maloney WJ. Efficacy of combined modality prophylaxis including short-duration warfarin to prevent venous thromboembolism after total hip arthroplasty. J Arthroplasty. 2006 Jun. 21(4):469-75. [Medline]. Knight LC, Baidoo KE, Romano JE, Gabriel JL, Maurer AH. Imaging pulmonary emboli and deep venous thrombi with 99mTc-bitistatin, a platelet-binding polypeptide from viper venom. J Nucl Med. 2000 Jun. 41(6):1056-64. [Medline]. Korelitz BI, Sommers SC. Responses to drug therapy in ulcerative colitis. Evaluation by rectal biopsy and histopathological changes. Am J Gastroenterol. 1975 Nov. 64(5):365-70. [Medline]. Lachiewicz PF, Kelley SS, Haden LR. Two mechanical devices for prophylaxis of thromboembolism after total knee arthroplasty. A prospective, randomised study. J Bone Joint Surg Br. 2004 Nov. 86(8):1137-41. [Medline]. Lassen MR, Ageno W, Borris LC, et al. Rivaroxaban versus enoxaparin for thromboprophylaxis after total knee arthroplasty. N Engl J Med. 2008 Jun 26. 358(26):2776-86. [Medline]. Lassen MR, Bauer KA, Eriksson BI, Turpie AG. Postoperative fondaparinux versus preoperative enoxaparin for prevention of venous thromboembolism in elective hip-replacement surgery: a randomised double-blind comparison. Lancet. 2002 May 18. 359(9319):1715-20. [Medline]. Leizorovicz A, Haugh MC, Chapuis FR, Samama MM, Boissel JP. Low molecular weight heparin in prevention of perioperative thrombosis. BMJ. 1992 Oct 17. 305(6859):913-20. [Medline]. [Full Text]. Leonardi MJ, McGory ML, Ko CY. The rate of bleeding complications after pharmacologic deep venous thrombosis prophylaxis: a systematic review of 33 randomized controlled trials. Arch Surg. 2006 Aug. 141(8):790-7; discussion 797-9. [Medline]. Levine MN, Hirsh J, Gent M, et al. Prevention of deep vein thrombosis after elective hip surgery. A randomized trial comparing low molecular weight heparin with standard unfractionated heparin. Ann Intern Med. 1991 Apr 1. 114(7):545-51. [Medline]. Lotke PA, Lonner JH. The benefit of aspirin chemoprophylaxis for thromboembolism after total knee arthroplasty. Clin Orthop Relat Res. 2006 Nov. 452:175-80. [Medline]. Loud PA, Katz DS, Bruce DA, Klippenstein DL, Grossman ZD. Deep venous thrombosis with suspected pulmonary embolism: detection with combined CT venography and pulmonary angiography. Radiology. 2001 May. 219(2):498-502. [Medline]. Loud PA, Katz DS, Klippenstein DL, Shah RD, Grossman ZD. Combined CT venography and pulmonary angiography in suspected thromboembolic disease: diagnostic accuracy for deep venous evaluation. AJR Am J Roentgenol. 2000 Jan. 174(1):61-5. [Medline]. Michiels JJ, Oortwijn WJ, Naaborg R. Exclusion and diagnosis of deep vein thrombosis by a rapid ELISA D-dimer test, compression ultrasonography, and a simple clinical model. Clin Appl Thromb Hemost. 1999 Jul. 5(3):171-80. [Medline]. Michota F, Merli G. Anticoagulation in special patient populations: are special dosing considerations required?. Cleve Clin J Med. 2005 Apr. 72 Suppl 1:S37-42. [Medline]. Mismetti P, Quenet S, Levine M, et al. Enoxaparin in the treatment of deep vein thrombosis with or without pulmonary embolism: an individual patient data meta-analysis. Chest. 2005 Oct. 128(4):2203-10. [Medline]. Muntz JE, Friedman RJ, eds. Case Vignettes: Thromboprophylaxis in Arthroscopic Surgery. Elsevier Excerpta Medica. 2006. Nawaz S, Chan P, Ireland S. Suspected deep vein thrombosis: a management algorithm for the accident and emergency department. J Accid Emerg Med. 1999 Nov. 16(6):440-2. [Medline]. [Full Text]. O'Brien SH, Haley K, Kelleher KJ, Wang W, McKenna C, Gaines BA. Variation in DVT prophylaxis for adolescent trauma patients: a survey of the Society of Trauma Nurses. J Trauma Nurs. 2008 Apr-Jun. 15(2):53-7. [Medline]. Prevention of fatal postoperative pulmonary embolism by low doses of heparin. An international multicentre trial. Lancet. 1975 Jul 12. 2(7924):45-51. [Medline]. Prevention of pulmonary embolism and deep vein thrombosis with low dose aspirin: Pulmonary Embolism Prevention (PEP) trial. Lancet. 2000 Apr 15. 355(9212):1295-302. [Medline]. Prevention of thromboembolism in spinal cord injury. Consortium for Spinal Cord Medicine. J Spinal Cord Med. 1997 Jul. 20(3):259-83. [Medline]. Ramzi DW, Leeper KV. DVT and pulmonary embolism: Part II. Treatment and prevention. Am Fam Physician. 2004 Jun 15. 69(12):2841-8. [Medline]. Rhodes JM, Cho JS, Gloviczki P, Mozes G, Rolle R, Miller VM. Thrombolysis for experimental deep venous thrombosis maintains valvular competence and vasoreactivity. J Vasc Surg. 2000 Jun. 31(6):1193-205. [Medline]. Ridker PM, Goldhaber SZ, Danielson E, et al. Long-term, low-intensity warfarin therapy for the prevention of recurrent venous thromboembolism. N Engl J Med. 2003 Apr 10. 348(15):1425-34. [Medline]. Rosendaal FR. Venous thrombosis: a multicausal disease. Lancet. 1999 Apr 3. 353(9159):1167-73. [Medline]. Salvati EA, Pellegrini VD Jr, Sharrock NE, et al. Recent advances in venous thromboembolic prophylaxis during and after total hip replacement. J Bone Joint Surg Am. 2000 Feb. 82(2):252-70. [Medline]. Schiff RL, Kahn SR, Shrier I, et al. Identifying orthopedic patients at high risk for venous thromboembolism despite thromboprophylaxis. Chest. 2005 Nov. 128(5):3364-71. [Medline]. Schweizer J, Kirch W, Koch R, et al. Short- and long-term results after thrombolytic treatment of deep venous thrombosis. J Am Coll Cardiol. 2000 Oct. 36(4):1336-43. [Medline]. Shepard RM Jr, White HA, Shirkey AL. Anticoagulant prophylaxis of thromboembolism in postsurgical patients. Am J Surg. 1966 Nov. 112(5):698-702. [Medline]. Snyder BK. Venous thromboembolic prophylaxis: the use of aspirin. Orthop Nurs. 2008 Jul-Aug. 27(4):225-30; quiz 231-2. [Medline]. Sors H, Meyer G. Place of aspirin in prophylaxis of venous thromboembolism. Lancet. 2000 Apr 15. 355(9212):1288-9. [Medline]. Taillefer R, Edell S, Innes G, Lister-James J. Acute thromboscintigraphy with (99m)Tc-apcitide: results of the phase 3 multicenter clinical trial comparing 99mTc-apcitide scintigraphy with contrast venography for imaging acute DVT. Multicenter Trial Investigators. J Nucl Med. 2000 Jul. 41(7):1214-23. [Medline]. Turpie AG, Bauer KA, Eriksson BI, Lassen MR. Fondaparinux vs enoxaparin for the prevention of venous thromboembolism in major orthopedic surgery: a meta-analysis of 4 randomized double-blind studies. Arch Intern Med. 2002 Sep 9. 162(16):1833-40. [Medline]. Turpie AG, Gallus AS, Hoek JA. A synthetic pentasaccharide for the prevention of deep-vein thrombosis after total hip replacement. N Engl J Med. 2001 Mar 1. 344(9):619-25. [Medline]. Turpie AG, Lassen MR, Davidson BL, et al. Rivaroxaban versus enoxaparin for thromboprophylaxis after total knee arthroplasty (RECORD4): a randomised trial. Lancet. 2009 May 16. 373(9676):1673-80. [Medline]. Communication about an ongoing safety review: Innohep (tinzaparin sodium injection). U.S. Food and Drug Administration. December 2, 2008. Available at http://www.fda.gov/Drugs/DrugSafety/PostmarketDrugSafetyInformationforPatientsandProviders/DrugSafetyInformationforHeathcareProfessionals/ucm136254.htm. Accessed: March 12, 2009.
van Dongen CJ, MacGillavry MR, Prins MH. Once versus twice daily LMWH for the initial treatment of venous thromboembolism. Cochrane Database Syst Rev. 2005 Jul 20. CD003074. [Medline]. Vedantham S, Millward SF, Cardella JF, et al. Society of Interventional Radiology position statement: treatment of acute iliofemoral deep vein thrombosis with use of adjunctive catheter-directed intrathrombus thrombolysis. J Vasc Interv Radiol. 2006 Apr. 17(4):613-6. [Medline]. Verstraete M. Direct thrombin inhibitors: appraisal of the antithrombotic/hemorrhagic balance. Thromb Haemost. 1997 Jul. 78(1):357-63. [Medline]. Weitz JI, Middeldorp S, Geerts W, Heit JA. Thrombophilia and new anticoagulant drugs. Hematology Am Soc Hematol Educ Program. 2004. 424-38. [Medline]. Wells PS, Anderson DR, Rodger MA, et al. A randomized trial comparing 2 low-molecular-weight heparins for the outpatient treatment of deep vein thrombosis and pulmonary embolism. Arch Intern Med. 2005 Apr 11. 165(7):733-8. [Medline]. Wood S. Apixaban (Eliquis) approved for DVT/PE prophylaxis post-hip or knee replacement. Medscape Medical News from WebMD. March 14, 2014. Available at http://www.medscape.com/viewarticle/821991. Accessed: March 25, 2014. Sundboll J, Hovath-Puho E, Adelborg K, et al. Risk of arterial and venous thromboembolism in patients with atrial fibrillation or flutter: a nationwide population-based cohort study. Int J Cardiol. 2017 Aug 15. 241:182-7. [Medline]. Wijarnpreecha K, Thongprayoon C, Panjawatanan P, Ungprasert P. Hepatitis C virus infection and risk of venous thromboembolism: a systematic review and meta-analysis. Ann Hepatol. 2017 Aug 1. 16 (4):514-20. [Medline]. Longitudinal ultrasonographic image of a partially recanalized thrombus in the femoral vein at the mid thigh. Principal deep veins of the lower extremity. Postphlebitic chronic venous insufficiency with ulceration. Deep venous thrombosis causing lipodermatosclerosis. Substantial mortality benefit for fibrinolytic therapy compared to anticoagulation in patients with right ventricular strain from pulmonary embolism (Konstantinides, 1997). Lower-extremity venogram showing outlining of an acute deep venous thrombosis in the popliteal vein with contrast enhancement. Lower-extremity venogram showing a nonocclusive chronic thrombus. The superficial femoral vein (lateral vein) has the appearance of two parallel veins, when in fact, it is one lumen containing a chronic linear thrombus. Although the chronic clot is not obstructive after it recanalizes, it effectively causes the venous valves to adhere in an open position, predisposing the patient to reflux in the involved segment. Two views of a commercially available thrombectomy device. The Helix Clot Buster works by creating a vortex with a spinning self-contained propeller that macerates the clot. No thrombolytic agent (ie, tissue plasminogen activator) is necessary when this device is used, but adjunct thrombolytic medications can be useful. Competing devices are available from other manufacturers. Popliteal vein thrombosis with normal compression of the common femoral vein. Image courtesy of Very Special Images with permission from Dr Lennard A Nadalo. Bilateral popliteal vein thrombosis with normal compression of the superficial femoral vein. Image courtesy of Very Special Images with permission from Dr Lennard A Nadalo. Popliteal vein thrombosis. Duplex sonogram showing absent flow. Image courtesy of Very Special Images with permission from Dr Lennard A Nadalo. Popliteal vein thrombosis. Gray-scale images showing compression failure. Image courtesy of Very Special Images with permission from Dr Lennard A Nadalo. This contrast-enhanced study was obtained through a Mediport placed through the chest wall through the internal jugular vein to facilitate chemotherapy. A thrombus has propagated peripherally from the tip of the catheter in the superior vena cava into both subclavian veins. 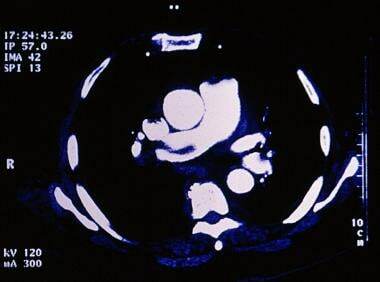 Superior vena cava syndrome in a patient with lung cancer. The computed tomography scan demonstrates a hypoattenuating thrombus that fills the superior vena cava. The patient was treated with anticoagulation alone. Antithrombin III levels and deep venous thrombosis formation. Time course of deep venous thrombosis risk. Computed tomography venography showing bilateral deep venous thrombosis. The arrows indicate bilateral deep venous thrombosis. 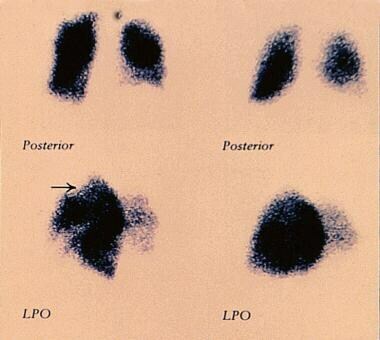 High-probability perfusion lung scan showing segmental perfusion defects in the right upper lobe and subsegmental perfusion defects in right lower lobe, left upper lobe, and left lower lobe. A normal ventilation scan will make the above-noted defects in the previous image a mismatch and, hence, a high-probability ventilation-perfusion scan. 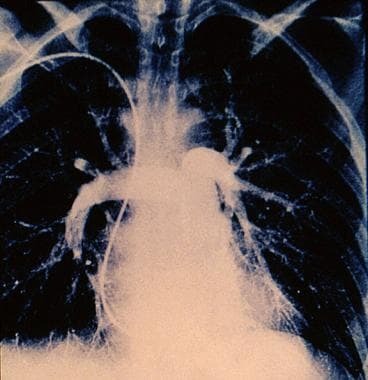 Sequence of colored digitized pulmonary angiograms (X-ray) in front view of the pulmonary arteries in a 43-year-old male patient after a heart attack (cardiac arrest), showing the presence of pulmonary embolism with a massive thrombus (clot, dark) in the right and left pulmonary arteries. An outline of the lungs are seen. Image courtesy of Science Source/Zephyr. Hematoxylin and eosin stain. Low-power view of a thrombus composed of platelets, fibrin, and leukocytes.